The Alumni Spotlight is an interview series where we interview Asia Studies alumni about their career paths, how they became interested in Asian Studies and for any advice that would be useful to our students. 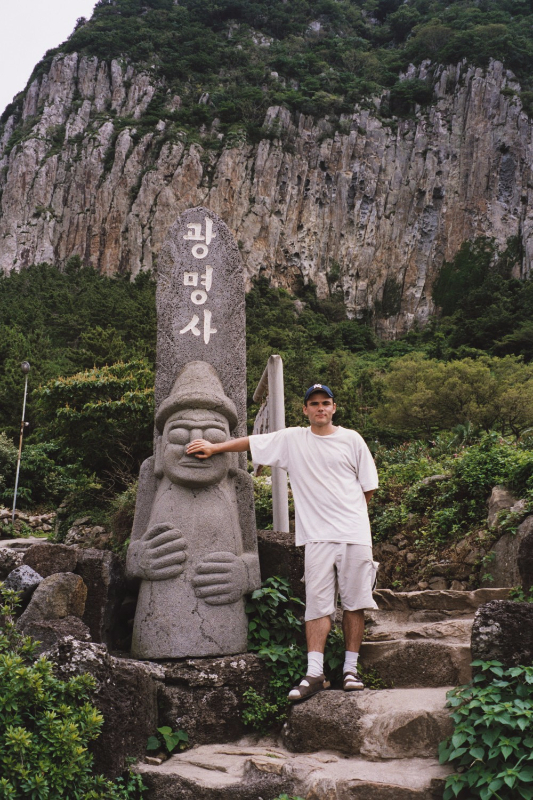 This interview features Jan Jettel, BA ’05, who minored in Korean at UBC. Mr. Jettel currently works in San Francisco and is Senior Vice President of National Accounts at Speakeasy Inc.
Touching the nose of a hareubang is said to give oneself good luck. Cheju island in 2001. I was born and raised in Germany and came to UBC after high school. I decided to take Korean as my elective in first year because Asian languages and culture were so different from anything I’d ever studied before and I was intrigued. Living in Vancouver was the first time for me to be immersed in an environment that’s so heavily influenced by Asian culture. I didn’t have that in Germany, so I decided to take a stab at something completely new. Much of what I learned in my undergrad was more or less a continuation and extension of things I’d already learned in high school – but Korean offered the opportunity to study something I knew nothing about. For example, it was quite a “Eureka!” moment for me when all the circles and squares in the Korean alphabet suddenly started making sense to me and I could read Korean. For me, there weren’t many other subjects that delivered this kind of sense of accomplishment. To be honest I didn’t really think of it in terms of value. The minor in Korean language was a nice addition to my major in economics and political science to add something “exotic” to my fairly common degree. I got my B.A. in 2005, and a lot has happened since. For my current job and further career I don’t think it matters very much anymore what I did in my undergraduate years. Having said that, I invested so much time in Korean and it’s had such a profound impact on my life that personally it’s very satisfying to have a minor in Korean. When asked about my work ethics in job interviews, I never fail to point out that I put myself through 4 years of Korean while simultaneously majoring in economics and political science. 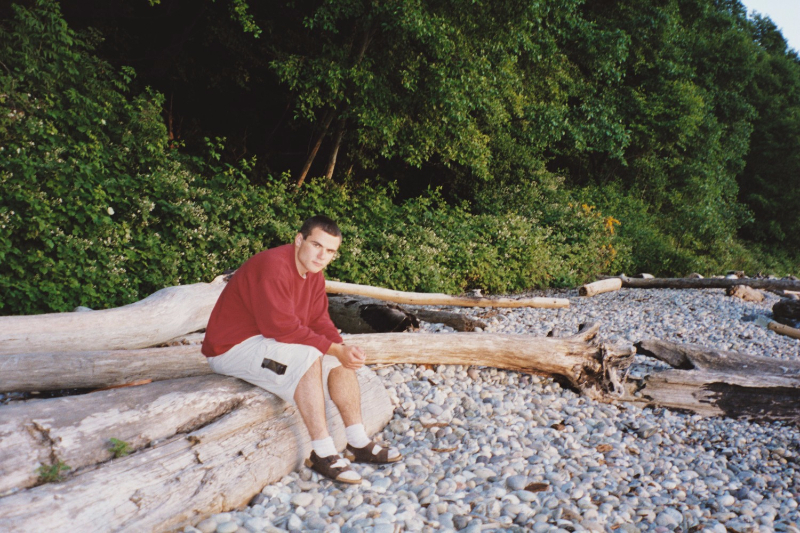 At Wreck beach circa 2002. When I registered for Korean 101 in first year, I didn’t really know what to expect or how far I’d take it. At the time it was just an interesting elective. However, I enjoyed the course a lot and continued in second year and beyond. Beside the actual subject matter I also enjoyed the fact that in the Korean department, classes were small, and everybody knew each other by name. I really got to know the other students and the professors, that’s something that really can’t be said for most other undergraduate courses. Even compared to my graduate degree, the individual attention we got from the professors and instructors in the Korean department was really amazing. In hindsight it seems that in my Korean studies courses I experienced what college is “supposed to be like.” Based on this very positive experience, I decided to go “all in” and minor in Korean. I also spent my 3rd year at Yonsei University in Seoul. This experience was maybe the highlight of my undergrad. I will say though that a downside of studying Korean was that though my Korean courses only accounted for 30/120 credits, they absorbed a disproportionate amount of time and it’s probably fair to say that I spent about as much time studying Korean as all the other 90 credits combined. I got my first “adult” job in Korea. I moved to Seoul and worked for The Korea Times. I got lucky with the timing because I happened to apply when the newspaper needed a lot of additional staff due to the upcoming 2005 APEC summit in Busan. They offered me an internship that turned into a full-time position after a few weeks. The position wasn’t very well paid, but possibly the most fun job I ever had. In addition that job I also worked at a freelancer for the German Chamber of Commerce in Korea. Finding a job wasn’t so easy because at the time there weren’t a lot of professional entry-level career opportunities available to foreigners, and I didn’t want to teach English. Moreover, transitioning from the relatively carefree student life at UBC to a full-time job in Korea wasn’t without challenges. I had no background in journalism and wasn’t sure if I’d be up to the task; it was very satisfying to see that with hard work and dedication I was able to do a got job despite my lack of formal training. That’s probably true for most entry-level jobs. On a personal level, it’s not easy to live in a foreign country when you aren’t fully fluent in the language. I currently work in a sales role for a professional services company in San Francisco. It’s interesting that universities don’t offer a degree in sales – and rightfully so because being a good salesperson is not something that can be taught in a classroom. In a corporate environment, entry level positions in sales or business development typically involve supporting the more senior salespeople, working with new and smaller accounts, and a lot of prospecting. Salespeople need to be able to deal with stress and uncertainty. For salespeople it’s important to be self-motivated, very organized, and driven by a sense of urgency because there’ll always be more tasks and to-do’s than you can fit in a day. The very same skills are necessary to get an Asian studies degree. Graduates can market their degree for sales positions by demonstrating that they have these qualities. At the end of the day, for most entry-level jobs employers want to see that applicants are reliable, eager, and willing to make an effort. In addition, the critical thinking and communication skills typically associated with a liberal arts degree come in handy for almost any job. Extracurricular activities also help demonstrate competency in these areas. 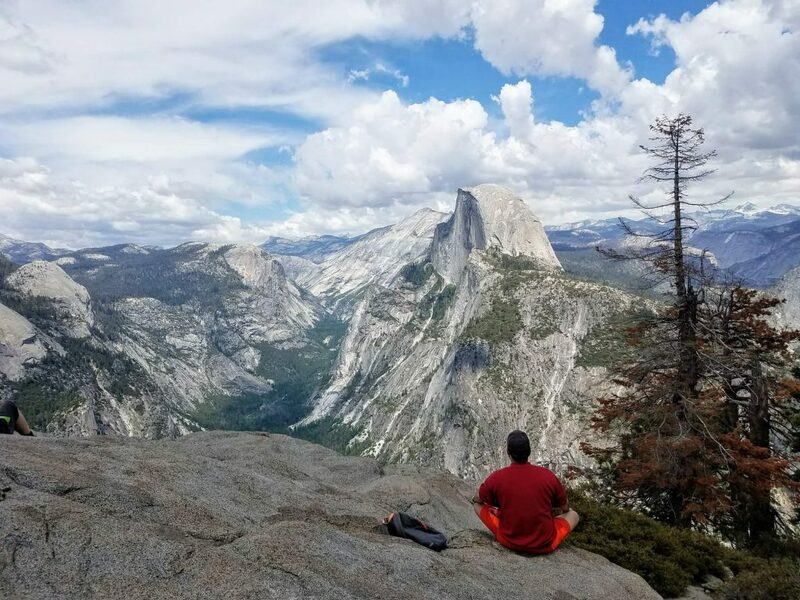 Jan in Yosemite Park with Half Dome in the background. 2018. Studying an Asian language as a non-heritage learner requires a lot of hard work, and especially the upper level courses teach you a lot of tenacity and humility because I remember I often felt overwhelmed by the difficulty and sheer volume of material. To this day I think that my minor in Korean is my proudest academic achievement. Being able to read authentic Korean short stories in 4th year will probably never cease to amaze me. Hwang Sun-won’s Sonagi is my all-time favorite.